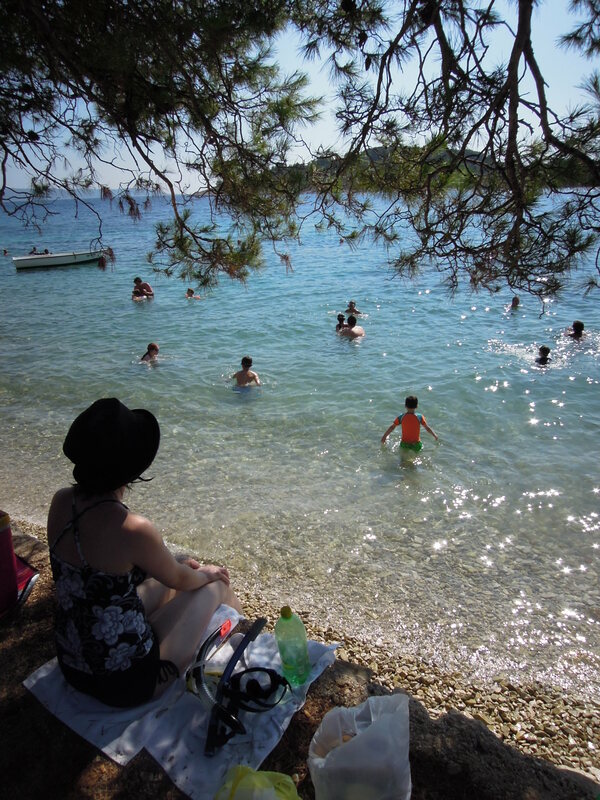 Today we spent the day surrounded by the noisy buzz of cicadas in fragrant pines and the clear blue-green waters of a little bay somewhere outside of Trogir. Yes, we found that pretty spot I was hoping we might find. The island (Ciovo) is supposedly full of them, but you either need to drive or take a boat from Trogir. Anyway, this little spot was not that far away (15 minutes drive from our pension) and we miraculously ended up avoiding the crazy, backed-up lines of traffic thanks to our impatience and Dave’s iPhone. It felt pretty secluded, although we still had company and access to one of the prettiest restaurants we’ve seen so far. We really took our time, allowing the boys to shape the day. Landon is almost completely independent around the water. He was in and out all day. The only intervention he needed was in the application of sunscreen and reminders to keep hydrated. Quentin is really starting to relax around deep water. He bobs around like a cork, but still needs us within arms reach, more for reassurance than anything. Stephen took both the boys out snorkeling. Landon is an old pro, but Quentin usually panics and needs to bring his head up every few breaths or so. Today, however, he had his first snorkeling epiphany. He discovered a fish city with his dad and completely forgot that he was underwater breathing through a tube. He was so pleased with himself! As for me, I enjoyed hanging out in the water, supervising as the boys jumped off of the dock or searched around the rocks for fish. I was able to go off on my own for a couple of relaxing swims, too. The water is so easy to enjoy here. It was nice to be in a state of mind where I could allow myself to be hypnotized by the perfect, almost mathematical lines that the sunlight created just in front of my hands as it reflected on the ripples of water. And yes, all of this meditative relaxation did result in my first sunburn of the trip. Fortunately, it was a minor one. The good life does demand some sacrifices!